It’s hard to reinvent the wheel. It’s hard finding new ways to tell stories that people know already. 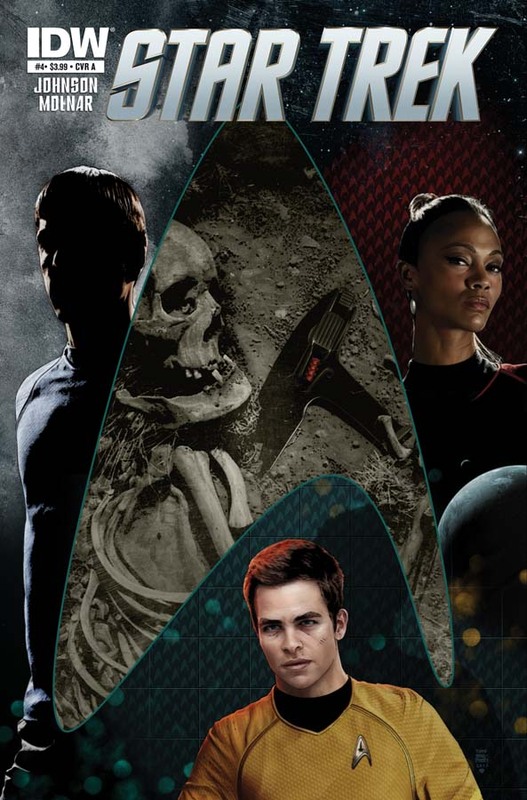 And yet, IDW, with their new Trek series, set in the alternate universe created in the 2009 movie, seems to be doing a fine job with it. 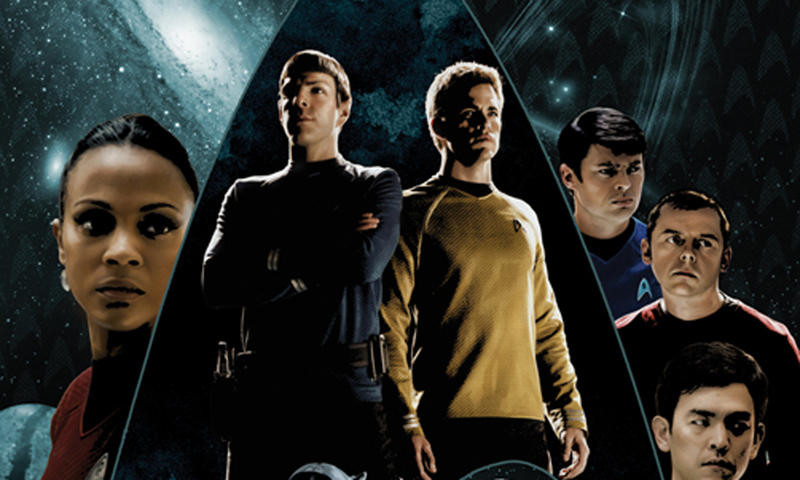 This time around, in issues 3 and 4, they revisit the 16th episode of Star Trek season 1 – The Galileo Seven. Once again, Mike Johnson is writing, adapting and working from the original script by Oliver Crawford and Shimon Wincelberg, with Stephen Mollnar and Joe Phillips continuing to serve as artists, with John Rauch adding colors. On the whole, I really enjoyed the adaptation, there’s enough familiar dialogue interspersed with the character behavior and talking patterns of the new universe to shake it up. Spock is leading an expedition to explore a quasar-like formation while the Enterprise is transporting Commissioner Ferris and supplies to Makus III (under a very strict time-table of course). An ionic disturbance causes the ship to crash-land on a barely hospitable world, leaving Spock in command of the group as they struggle for survival and get off the planet before the Enterprise is beyond their reach. I like the fact that they’ve introduced Rand, and she’s aboard the Galileo along with Spock, McCoy, Scotty, Latimer, Gaetano and Boma. Soon enough, they discover they aren’t alone on the planet, and trouble is headed their way. There are a lot of moments I like in these two issues, I love the chat McCoy has with Spock about this being his first real command, after Kirk was promoted around him to ship’s captain. It’s the same talk as featured in the original ep, but just that little bit different. There’s some wonderful by-play between McCoy and Scott, and you can see a real friendship starting to develop there, which is great. And I can totally hear Simon Pegg and Karl Urban saying those lines in my head, so I would say the writing is true to the new characters. There was one thing I didn’t care for. Uhura goes after Spock, by commandeering a shuttlecraft. I’m actually ok with that part. But it takes away the brilliant course of action Spock comes up with in the original episode. In the comic they are trying to get enough height to reach orbit, but are still too heavy, and they are deciding who will jump, fall to their death and lighten the load (they can’t land and launch again, they only have enough power for the one attempt). I’m still ok with that. Mostly. Although Spock figures they were too heavy before takeoff and did anyway. Not the best decision, even with that aggressive species knocking at the door. They don’t have enough power to make orbit, and ignite their exhaust trail like in the episode, in effect, making a flare. Instead, Uhura arrives to save the day. 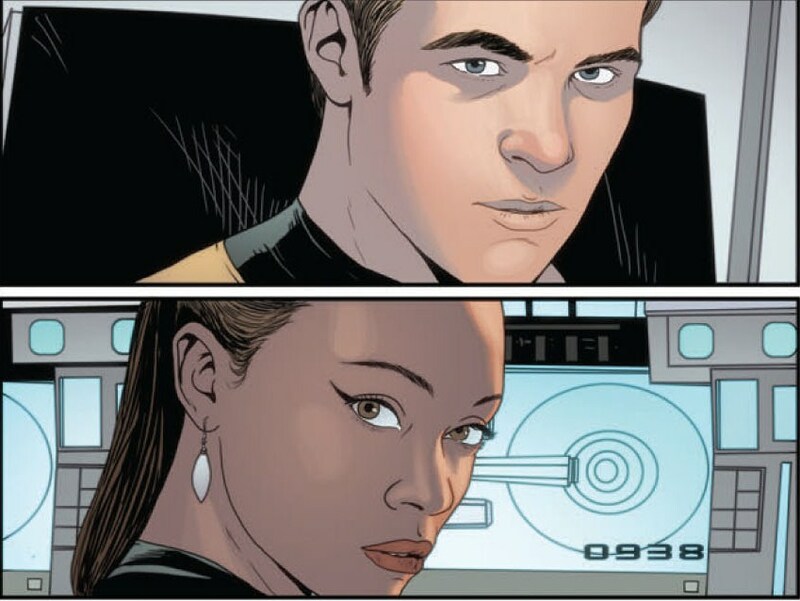 Yay Uhura, great character moment for her. But it doesn’t let Spock have his shining moment yet, to show he’s ready for command. It’s not enough to ruin my read of the story, and being a Vulcan, we know Spock doesn’t have to prove himself a strong and capable leader, but we know he’s going to sooner or later. 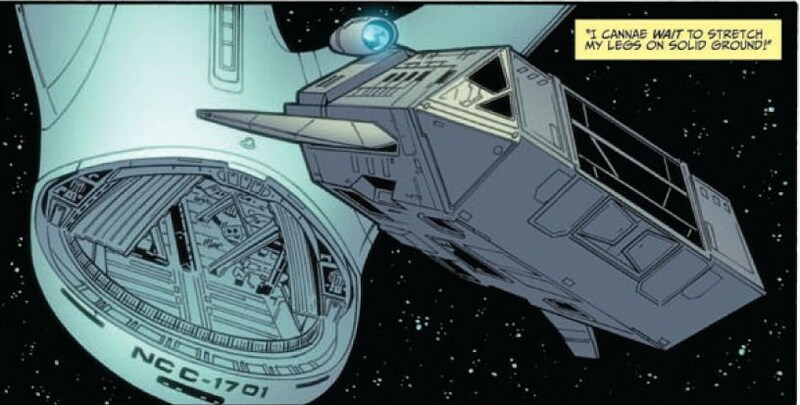 I love that Kirk is thinking of his crew and his ship first and foremost. It’s obvious that now that he’s in the captain’s chair, he’s staying there (I don’t see this one being promoted to Admiral by anything short of blackmail). All the characters are easily identifiable, and resemble their actor counterparts, the writing is fun, and like I said, it’s fun seeing old adventures in new ways, but I’m looking forward to brand new adventures too. But I’m ready for more adventures in the final frontier!